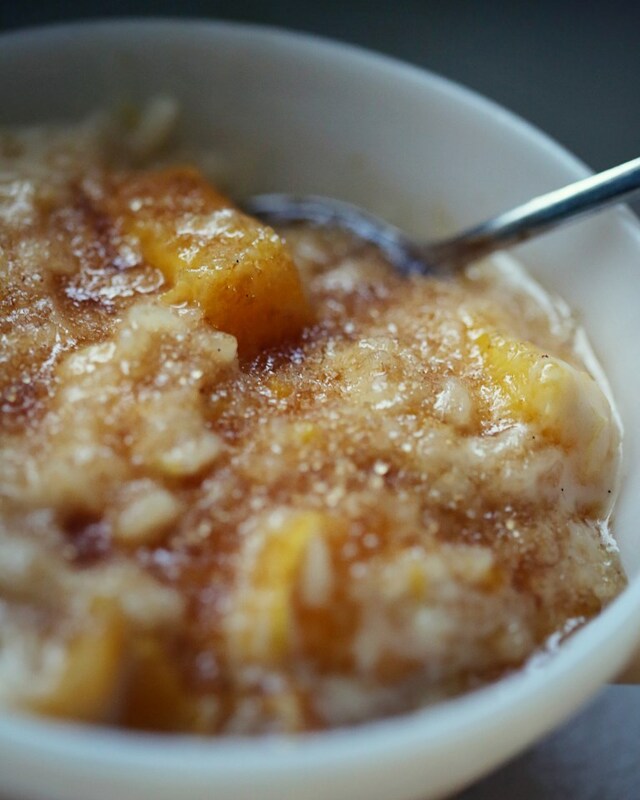 This lovely little bowl of sunshine was a great switch-up in our regular oatmeal routine last week. Out of Tyler Florence’s wonderful book, Start Fresh, this was in the 9-12 month section as a breakfast or snack option. This is simply an amazing cookbook. Given to me by my dear friend and fellow foodie, Becky, I have made several recipes from the book and will post a few more favorites before the week is over! This one was an easy and delicious start – Roasted peaches, apple juice, coconut milk, rice and brown sugar?! Okay, okay, maybe a bit too much sugar to start every day, but for sure a wonderful afternoon snack and really, not THAT much sugar if you leave out the apple juice and substitute water! We loved it, Olive loved it, and even my dad, who was stopping through on his way to a doctor’s appointment, loved it! I’d highly recommend it as a new option for the mornings! If you use brown or basmati rice, it’d be even healthier! In a large saucepan, melt the butter over medium heat until bubbling. Add the peaches and cook until they have released some of their juices, about 5 minutes. Add the rice and stir until well coated. Add the apple juice, milk, coconut milk, cinnamon stick, vanilla and salt and bring to a boil. Reduce heat to medium, cover, and cook until the rice is tender and most of the liquid has been absorbed, about 20 minutes. Fold in the sugar, and stir until well blended. Serve warm! 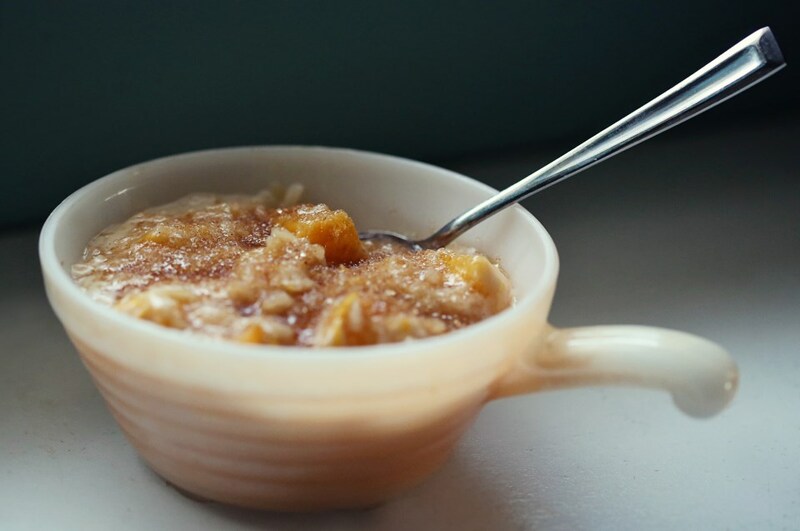 This entry was posted in Baby Food Recipes, Breakfast, Children, Desserts, Monday Meals, Snacks, Uncategorized and tagged baby food breakfast, baby food recipes, breakfast for kids, breakfast options, brown sugar, cold weather food, kid-friendly, peaches, sticky rice, Tyler Florence recipes, Tyler Florence Start Fresh, winter breakfast. Bookmark the permalink. Sounds amazing. So glad you didn’t add raisins! Why would I do that? Haha! I’m so glad y’all are still enjoying the book! I know I wanted to make every recipe in there – puree’s included! Ha ha 🙂 Can’t wait to see what’s next!